Issue 7.9 is now online! The September issue of Methods is now online! This month’s issue contains two Applications articles and three Open Access articles, all of which are freely available. – Arborist Throw-Line Launcher: A cost-effective and simple alternative for collecting leaves and seeds from tall trees. The authors have also provided some tutorial videos on YouTube. – ctmm: An R package which implements all of the continuous-time stochastic processes currently in use in the ecological literature and couples them with powerful statistical methods for autocorrelated data adapted from geostatistics and signal processing. Our first Open Access article this month – ‘The ecologist’s field guide to sequence-based identification of biodiversity‘ – comes from Simon Creer et al. The paper walks the reader through sampling and preservation of genomic material in the field as well as a number of lab techniques including nucleic acid extraction approaches, marker gene assessment, metagenomics and more. The authors conclude by highlighting future opportunities in the field of systems ecology afforded by effective engagement between the fields of traditional and molecular ecology. Rampal Etienne et al. answer the question ‘How reliably can we infer diversity-dependent diversification from phylogenies?‘ in the second Open Access article of the month. The authors simulate phylogenetic branching under linear negative diversity-dependent and diversity-independent models and estimate from the simulated phylogenies the maximum-likelihood parameters for three different conditionings – survival of the birth–death process given the crown age, on tree size (N) and on tree size given the crown age. They conclude that conditioning on crown age has the best statistical properties overall, but caution that parameter estimates may be biased. Our third and final Open Access article in this month’s issue comes from Devin Goodsman and Mark Lewis. In their paper – titled ‘The minimum founding population in dispersing organisms subject to strong Allee effects‘ – the authors derive an expression for the minimum founding population size for a general integrodifference equation model of a dispersing population with a strong Allee effect. Calculation of minimum founding population sizes may prove useful for predicting invasion success based on propagule size and for maximizing the success of species reintroductions when strong Allee effects exist. Our September issue also features articles on Mathematical Tools, Remote Sensing, Abundance Estimation and more. 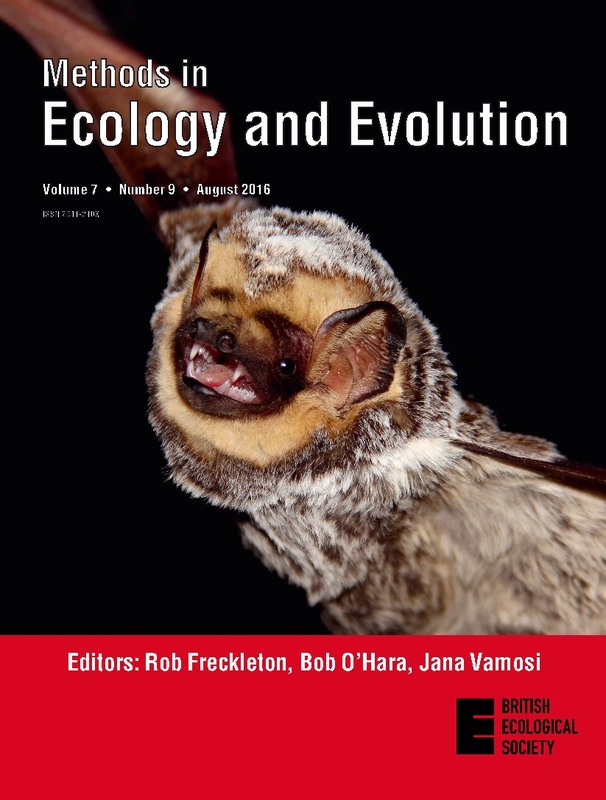 This month’s cover image shows a Hoary Bat or Hawaiian Hoary Bat (Lasiurus cinereus), a charismatic species due to its beautiful and unique fur colouration. It is an insectivorous and migratory bat, widely distributed across the Americas, that mainly inhabits forested areas. This species, like many other Mexican bats, is poorly known and is under threat due to the high rates of climate and land-use change in the country. The individual shown in the picture was captured in the state of Chihuahua, Mexico. It was measured, identified, recorded and immediately released on site as part of a project to ensemble a national bat acoustic library. In the associated article – ‘Acoustic identification of Mexican bats based on taxonomic and ecological constraints on call design‘ – Zamora-Gutierrez et al. compile the biggest library of bat sounds to identify bats from their echolocation calls in a megadiverse country. They show that it is possible to acoustically identify a high number of bat species for rapid biodiversity assessments. Acoustic surveys are increasingly used to monitor biodiversity and bats are ideal candidates for this as they constantly emit sound to explore their surroundings. It is vital to map ecological communities and track their changes through time in order to better understand and counteract the effects of the Anthropocene. To keep up to date with Methods newest content, have a look at our Accepted Articles and Early View articles, which will be included in forthcoming issues. This entry was posted in Journal updates and tagged Abundance Estimation, Allee Effects, Arborist Throw-line Launcher, Bats, Bioacoustics, biodiversity, ecology, evolution, methods, phylogenetics, Population Ecology, R, Remote Sensing, statistics by Chris Grieves. Bookmark the permalink.